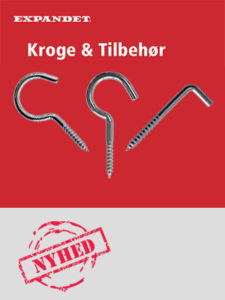 We call it "Denmark's new craftsman screw"
Because it is now possible to get quality screws at reasonable prices. CE marked for attachment of , inter alia, light facades. 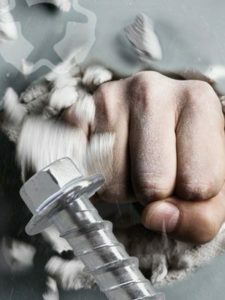 The Expandet C-Bolt is the mounting bolt to tackle any challenge in concrete. C-Bolt is easy and economical. With its small drill diameter, expansion-free assembly and with no need for special tools. See our sheet with technical specifications here. 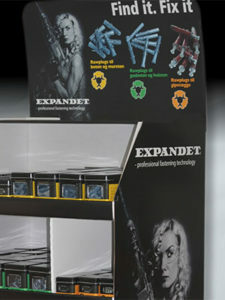 Easy and user-friendly system that makes it extra easy for the consumer to find the right product for the job. Is divided into color-coded and durable cans with clear instructions on each product. Read more here. 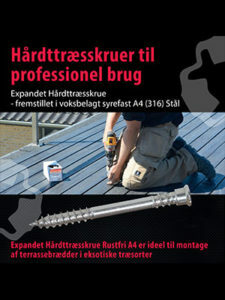 Expandet hardwood screw in stainless A4 designed for mounting the decking of high density and acidic content (exotic wood). The special head on the hardwood screw prevents chips rising, thereby leaving a great result. Read more here. Download the free Expandet Calculation Program The Expandet Calculation Program is a user-friendly and manageable tool that allows for the design of anchorages in concrete according to the latest European guidelines and standards.